I had stumbled upon Absynth Aura only because I had worked for Rockstar Weekly. I had the chance to review their album "Unbreakable" and liked it alot and have now thanks to JT got this interview via email. worked in close collaboration with Michele "Dr.Viossy" Vioni and Giorgio "JT"
Terenziani to release the song "Will is Power". Claudia had wri!en "Will is Power"
release the song at its best. Claudia: I studied with a few teachers but I trained mainly by myself. During the years I have approached different kinds of music and this has given me the chance to get to know different styles and techniques...the main thing for me is to sing good music. “born without a hand sings the strength to carry on”, this is what a paper wrote about me a few years ago...all that I can say is that a physical limit like mine has never stopped me in front of anything...I used my head and my wit and I found a way to play the piano, the drums, and even the acoustic guitar...I may not be the best player, but...you try and do it! Anthony: Will is Power is listed as the song the group first recorded how special is that song to you? Mark: this song means a lot to me because it's the song that started it all, and it's thanks to this that the band was formed. For me it's a true emotion every time I listen to it or I play it. JT: to me this song represents the music world of Claudia: groovy, powerful and with great melodies. During the recording session of this song we understood that something would come of this and…here we are! Dr.Viossy. This is a very special song, 'cause the band Absynth Aura was born from that. It represents not only the core of all our lyrics on Unbreakable, but it also stands for an important part of AA's music style. As Giorgio said, it's groovy and heavy at the same time, it has some very beautiful funk and soul vocal lines that are perfectly mixed with the instrumental parts. We're very proud of Claudia, who wrote this song all alone and...of ourselves for making it sound like it does! Claudia: Will is power signals the birth of Absynth Aura...I wrote this song to remind myself and other people that even when everything seems to be too complicated you've never got to give up...determination and commitment make sure you can fulfill your dreams. Anthony: Also have you all got families and would you like to share the family life with the readers? Claudia: to be honest I never like to talk about my private life...all that I can say is that I thank the heavens I have a wonderful family who support me day by day. JT: my whole world is on my facebook page ah ah. I have a lovely girlfriend, a wonderful family, lots of friends and my own studio, I think I don’t need anything else… mmmh maybe I’d like to posses Thor’s hammer: Mjolnir or a Gold Cloth. To be serious we are normal people whether we are in the studio on stage or off stage. Dr.Viossy: my life too is on my Facebook page! I'm a true nerd, always online, “Wired” all the time, so if you want to get in touch with me, send me a PM and I'll answer right away. Call me on the phone and you'll never get through to me, hehe! I live with my lovely soul-mate and my cat, surrounded by guitars, studio equipment, Apple devices and electronics of all kinds, but also tons of books...paper books! Anthony: How would you all describe your sound? 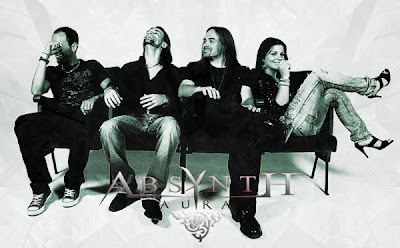 JT: Absynth Aura is more than 4 musicians or friends who play together, it’s the magic to understand each other and to try to push forward our limits together. There are a lot of influences in our music, but most of all I feel it's the “respect” for the other musicians. Everyone of us wants to do his best, but at the same time I know that a band is a whole sound not just drums, guitars, bass, vocals… so every arrangement, every sound, every single note speaks about the musician himself but it’s also a way to be a member of the band. I think there is an Hard Rock scent in all the CD, but also prog and metal stuff as funk or soul echoes. Everyone of us take the best part of the other musicians trying to be a better musician and mate than before! Claudia: Our sound can be powerful and striking but at the same time can be delicate and profound. Four different musical roots, four different souls...the result is the sound of Absynth Aura. Anthony: Believe Me starts the new album and that is a great song vocals, guitar(solo)bass and drums are all strong in this song feels like the band has been playing for many years is that true? Dr.Viossy: “Believe me” or not (sorry about the wordplay :-D) we have rehearsed just a few times the songs of the album. We like working in our home studios to pre-produce all the instrumental parts, overdubs, vocal arrangements etc. so they are perfectly crafted and ready to be recorded for the album. To me an album is quite different from a live show. An album is like a movie. It's “fake, edited and cut”, if you understand what I mean. A live show is like theater, everything happens “here and now” and you can't cheat or listen to two guitars if you have just one. So, if you come and see Absynth Aura live, you can listen to a very different approach and some different arrangements. We change instrumental parts, sometimes we re-arrange the songs completely, we even have 3-4 different versions for some songs so you have a different feeling every time you come to our live shows. I think it's very interesting for the audience and I love working like this on our Music. Claudia: The band hasn't been playing together for a long time but there's a central thread that joins us all together...the freedom of expression. We have united different styles and tones and the result has been strong and striking. The best surprise has been playing the songs live and finding out the energy and the emotions that this has created in all of us. Anthony: If someone likes your album where can they pick one up or can they order online? There are a lot of online stores where you can find it: iTunes, Amazon, Cd Baby. On Our website or on some web-stores you can also order the physical copy of Unbreakable. Anthony: Are there any plans of a tour of North America or is that too costly as of right now? Anthony: Now with all the bands that have female singers at the lead like Evanescence, Lacuna Coil, In This Moment & Nightwish to name a few do you feel under pressure? or are you just wanting to do your own thing and don't want the comparison? Claudia: I personally admire each leading singer of the bands you have named, they are all fantastic women and I wish I could enter their circle...the sound of Absynth Aura though is definitely different compared to the one of these groups and that's why we think that something big can come of this experience. Dr.Viossy: No pressure at all. First of all 'cause I think that Absynth Aura are very different from the bands you named. 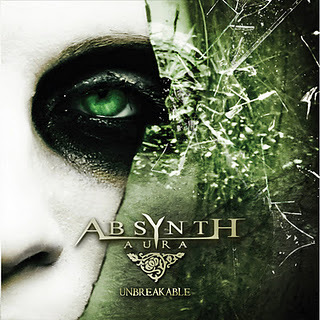 In nearly every review of Unbreakable you can read this: “You might think that female singer + heavy approach = Lacuna Coil and others, but Absynth Aura are different, because...”. I like all the bands you listed and I'm proud that Lacuna Coil come from Italy and spread their word around the world. But I also think Absynth Aura have a completely different approach. You can hear it in the guitar and bass tone, in the drums style, in the vocal lines and arrangements, in the overall sound of Unbreakable. I'm so proud that every reviewer noticed that, 'cause that's what we wanted to achieve! Anthony: I would like to get some interviews under my wing in terms relating to that question and then have singers from those bands and Arch Enemy, Kittie, Cadavaria, & Otep and the relation of women in metal as I feel this is not something that is covered enough, any thoughts on that topic Claudia? 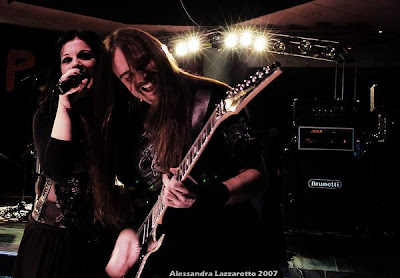 Claudia: many people think that metal is an exclusively male territory...instead I think that women have the possibility to express frailness, sweetness and aggressiveness at the same time, so let's say that they possess all the qualities that are needed in this kind of music, mainly in rock/melodic metal. Anthony: I watched the TV Promo that is on You Tube and it covers the song on this album. Your vocals on Looking for the One are beautiful what was the inspiration for the song-or do the lyrics say it all? Claudia: “looking for the one who can save my soul”...and that one is the trust in ourselves... In the past I always searched for the truth, for security and for solutions....and then I understood that all I needed to do was to look inside myself and every question would find its answer...don't you think? Anthony: I have always been a hard Rock fan I find your singing style very close to that of Darby Mills from The Headpins do you agree? 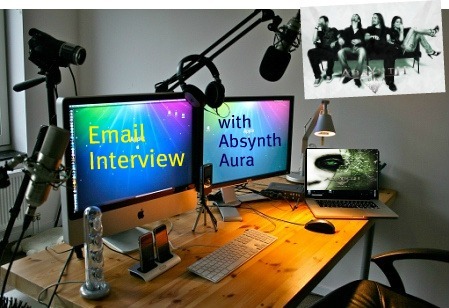 Absynth Aura: thank you very much for the interview! We're so glad you got in touch with us and we hope to come to Canada very soon! Thanks to all the members from Absynth Aura for the interview!